This rugged tree stood alone in in an area near the center of the Wichita Mountains Wildlife Refuge. Dan Marsh shoots from the prone position to stay out of a howling wind at Sitting Rock. Dan Marsh became editor at my newspaper, The Ada News, in the spring of 2013, and he and I have become good friends, and he has grown powerfully as a photographer. Last fall he bought a Nikon D3200 digital camera and two lenses, and took up my invitation to sit through my class, which he enjoyed. Dan’s been hungry to expand his photographic opportunities, so when he gets free time, he finds somewhere to go to shoot. He’s been out to our patch a few times. He’s been to graveyards. He’s been to the Chickasaw National Recreation Area in nearby Sulphur several times. When I asked him if he wanted to go hiking in my old haunt, the Wichita Mountains Wildlife Refuge in southwest Oklahoma, he jumped at it. After some preparation, an ice storm moved in during early December, so we moved the date back to Friday, January 3. The Holy City of the Wichitas shines in morning sun under a pearl blue sky. Your host hikes in the boulder field near the infamous Spider Cave. We met up in downtown Ada early in the morning and hit the road. It was bitterly cold, but as the sun came out, the temperature climbed out of the 20s, and our only issue with the weather was the wind, which was howling out of the south. We grabbed some breakfast in Medicine Park, then made for the Refuge. Because the wind was still biting, we spend some time chasing the light and finding some photo ops, like the legendary Parallel Forest, Meers, Prairie Dog Town, and the Blue Canyon Wind Farm, before getting on the actual trail at around 11 am. Our first trail was the Charon’s Garden trail that leads south from the Sunset campground. We made our way south on it, but found it somewhat uninteresting, and when the trail went cold (meaning we could no longer find it to follow it), we turned around. Brilliant sunshine took the edge off the cold, as in this image at the legendary WPA plantation known as the Parallel Forest. At my request, Dan made this image of me on a boulder atop Mount Scott, the high point of the Refuge. 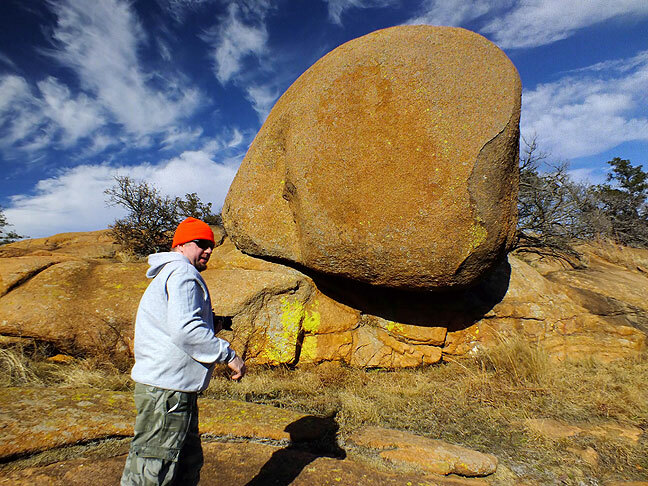 The next hike was to my favorite spot in the Wichitas, the area in Charon’s Garden we long-ago nicknamed the Glacier Rocks. We bouldered up the enormous granite faces and explored, all the while making some fairly solid images. The cold meant we had the place to ourselves. Before we knew it, we were at Sitting Rock, where the wind was unhindered and insanely scary. I did not shimmy up the last 20 feet to the actual peak, fearing the wind would make it too dangerous. This is the spot near Sitting Rock where we decided not to climb higher. During fair weather, it’s an easy move to the top. I’ve been making variations of this image for 35 years. 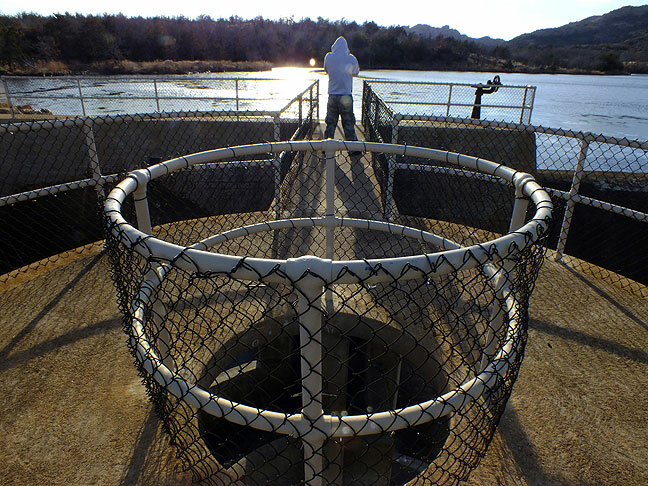 At French Lake dam, I thought it would be funny to climb down the service ladder near the spillway. The rung just below me was completely rusted out. Above and around us for much of the day were Air Force fighter jets making strafing runs at the dummy airfield at nearby Fort Sill. I promised Dan we’d see a bison, and we found one quite close to the road for him to photograph. The truly unusual photo moment came as we walked along French lake, which had a large ice floe on it. The wind was still strong, and it pushed the ice around, making it hiss and pop. 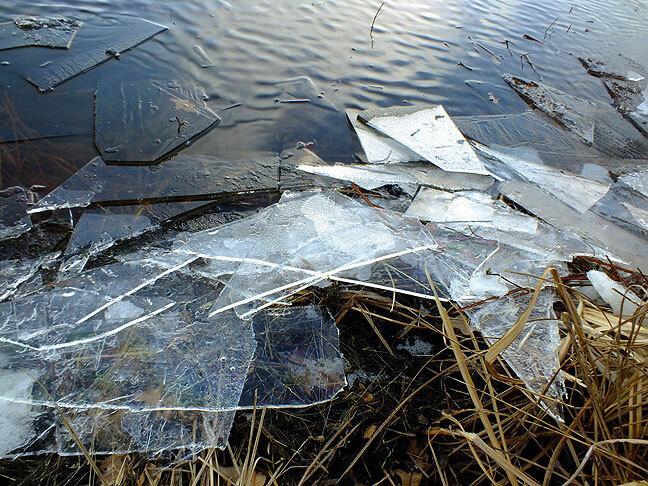 At one point we walked right up to the edge of the lake to find huge shards of ice cracking and shattering as they collided with the shore. Slabs of ice on French Lake collide with the shore, blown by a fierce wind as the lake melted. 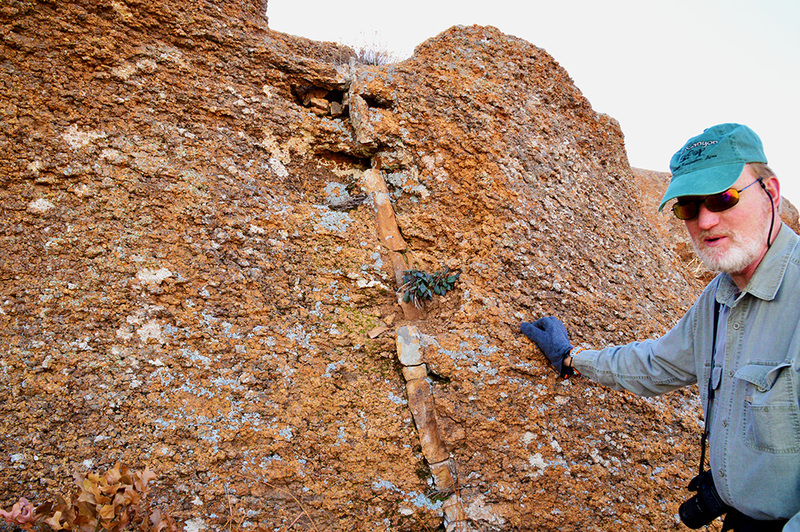 Dan photographed me talking about intrusive igneous rock, proving that I paid attention in high school geology class. Our final stop was the traditional drive to the top of the Refuge high point, Mount Scott. The late afternoon light was nice, but the wind was howling worse than ever. We found it impossible to compose pictures because the wind pushed our cameras out of our hands. In fact, all we could do was laugh at how ridiculous it was. Dan finds his way as we descend in the vicinity of Lock Rock. Dan makes pictures on the highway near Prairie Dog Town in the Wichita Mountains. 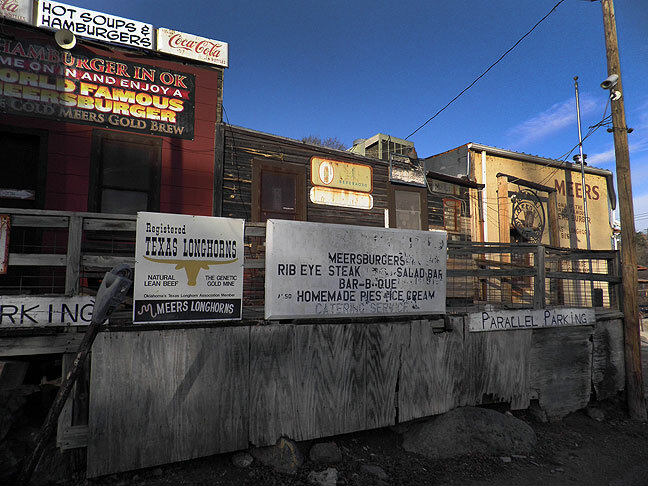 The Meers Store and Restaurant wakes up on a cold morning. We were there before it opened. 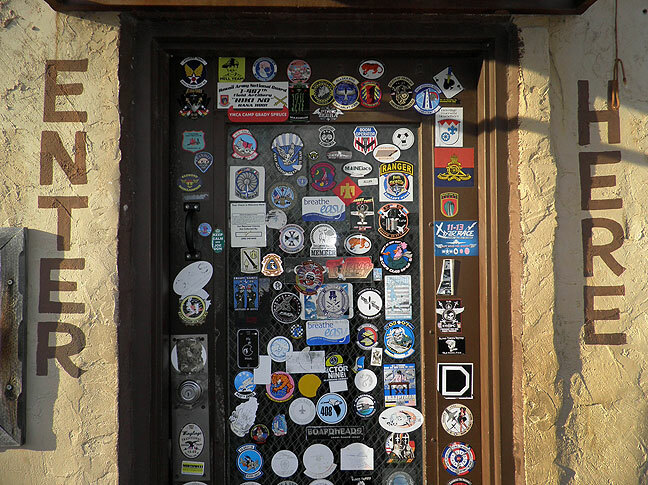 This is another view of the Meers Store. 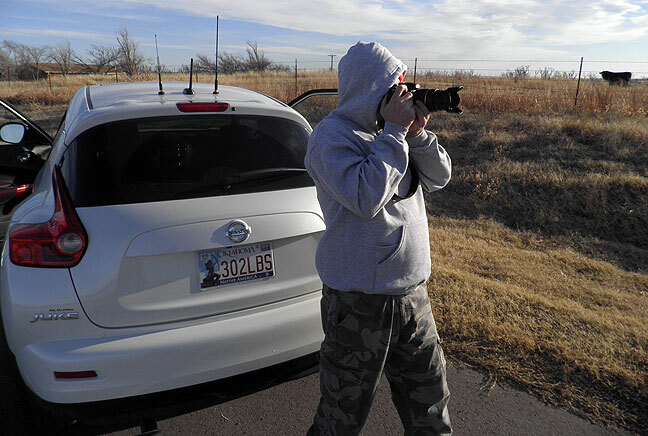 Dan photographs a handsome horizon as we search for the Blue Canyon Wind Farm. 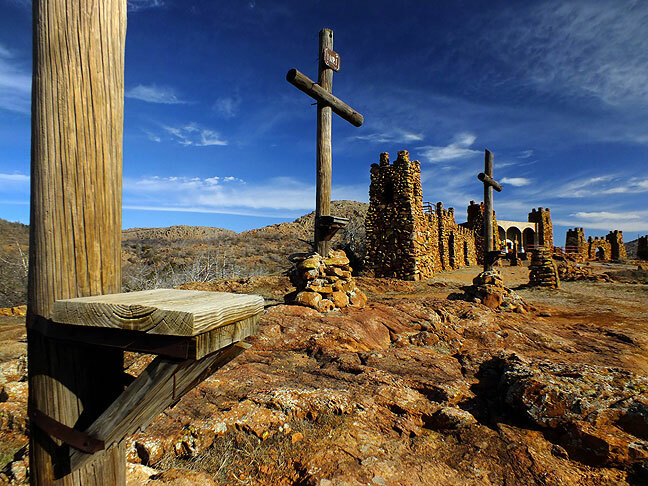 The Holy City of the Wichitas is set against a deep blue morning sky. Dan strolls among the boulder fields of the Charon’s Garden Wilderness. 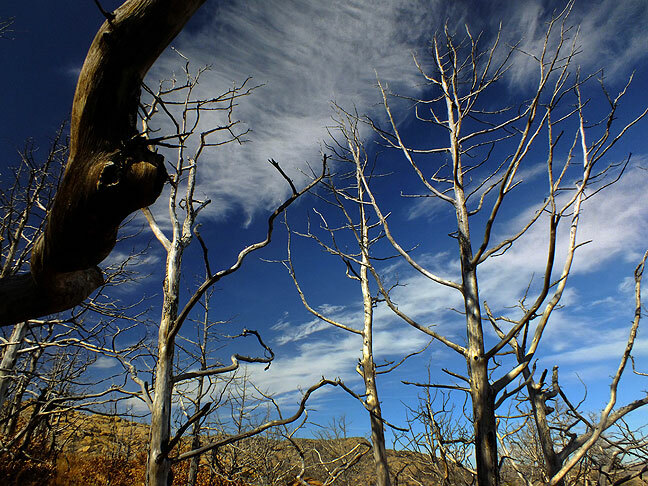 Dead trees are cast against a pure blue sky in the Charon’s Garden Wilderness. 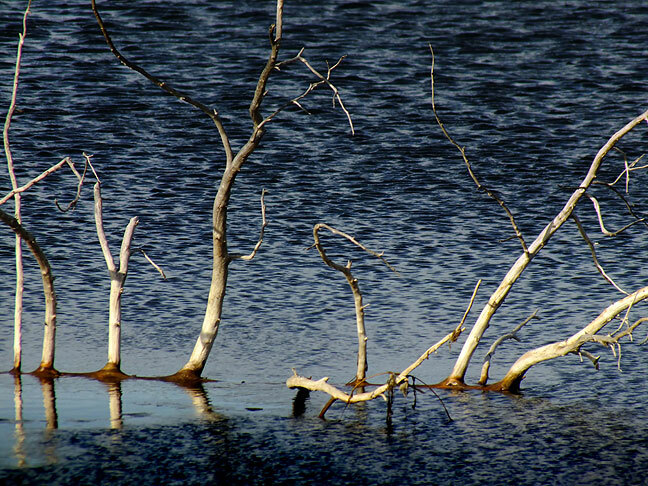 Dead trees peak above the waters of French Lake. 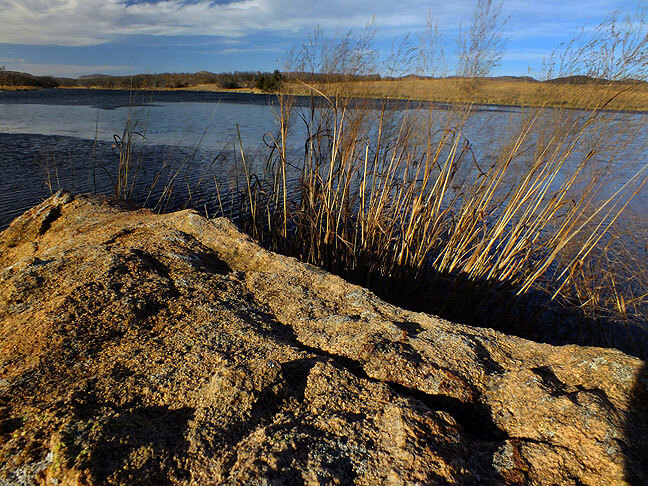 This broader view of French Lake shows wheat grass in handsome afternoon light. Dan stands on the dam at French Lake to make pictures. 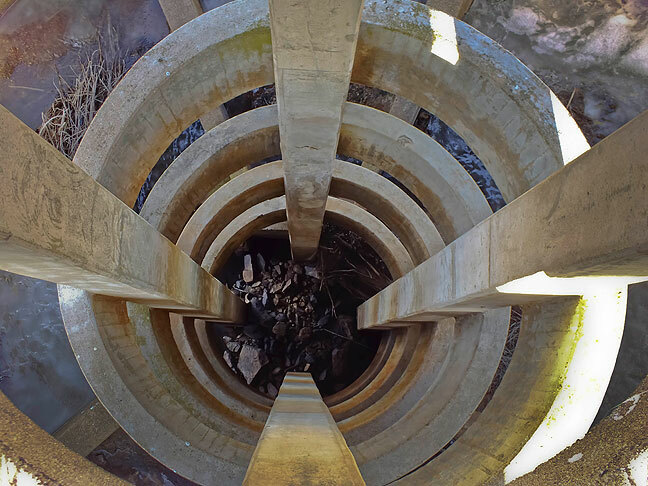 This view looks down the spiral spillway at French Lake Dam. In addition to being something of a sight to behold, these slabs of ice driven by wind made quite an amazing hissing and popping noise. 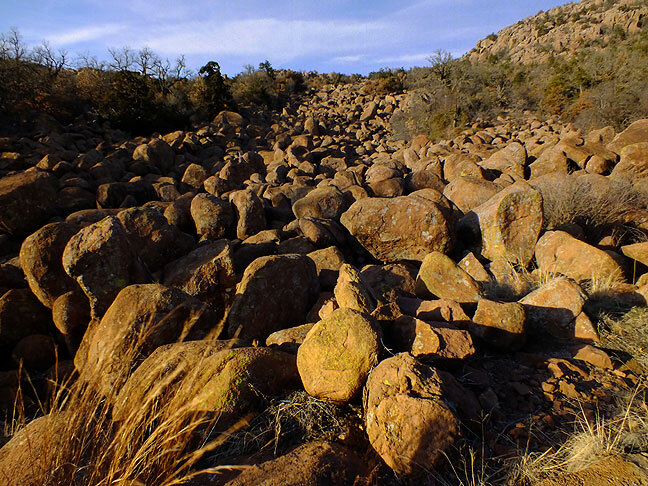 This boulder field is near the base of Mount Scott, and remains on my to-do list of hikes. 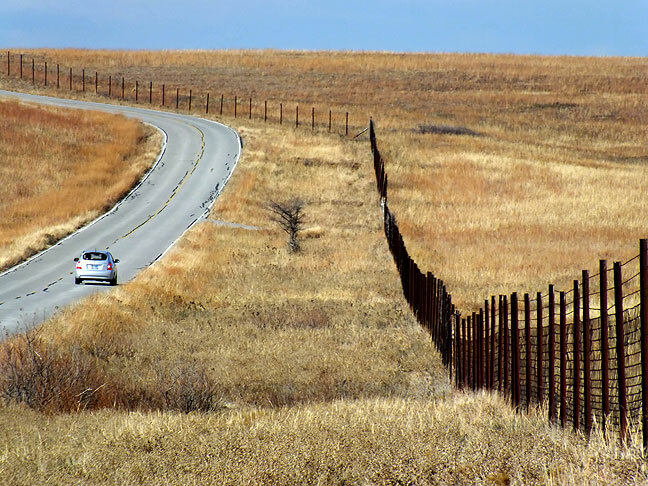 This fence divides the public area of the Refuge from the Special Use Area. Glad you included some additional pix on this entry that I’d never seen before. A spectacular reminder of one of the 2-3 most spectacular days of my life. Look forward to going back, now that I “really know what I’m doing.” Christa needs to see it, too.